Alexandria (/ˌælɪɡˈzændriə/ or /-ˈzɑːnd-/; Egyptian Arabic: إسكندريه‎ Eskendereyya; Arabic: الإسكندرية‎ al-ʾIskandariyya; Coptic: ⲁⲗⲉⲝⲁⲛⲇⲣⲓⲁ Alexandria or ⲣⲁⲕⲟϯ Rakote, Greek:Αλεξανδρεία) is the second-largest city in Egypt and a major economic centre, extending about 32 km (20 mi) along the coast of the Mediterranean Sea in the north central part of the country. Its low elevation on the Nile delta makes it highly vulnerable to rising sea levels. Alexandria is an important industrial center because of its natural gas and oil pipelines from Suez. Alexandria is also a popular tourist destination. Alexandria was founded around a small, ancient Egyptian town c. 332 BC by Alexander the Great, king of Macedon and leader of the Greek League of Corinth, during his conquest of the Achaemenid Empire. Alexandria became an important center of Hellenistic civilization and remained the capital of Ptolemaic Egypt and Roman and Byzantine Egypt for almost 1,000 years, until the Muslim conquest of Egypt in AD 641, when a new capital was founded at Fustat (later absorbed into Cairo). Hellenistic Alexandria was best known for the Lighthouse of Alexandria (Pharos), one of the Seven Wonders of the Ancient World; its Great Library (the largest in the ancient world); and the Necropolis, one of the Seven Wonders of the Middle Ages. Alexandria was at one time the second most powerful city of the ancient Mediterranean region, after Rome. Ongoing maritime archaeology in the harbor of Alexandria, which began in 1994, is revealing details of Alexandria both before the arrival of Alexander, when a city named Rhacotis existed there, and during the Ptolemaic dynasty. 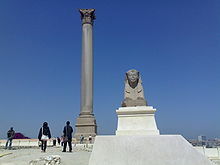 Alexandria is believed to have been founded by Alexander the Great in April 331 BC as Ἀλεξάνδρεια (Alexandreia). Alexander's chief architect for the project was Dinocrates. Alexandria was intended to supersede Naucratis as a Hellenistic center in Egypt, and to be the link between Greece and the rich Nile valley. Although it has long been believed only a small village there, recent radiocarbon dating of seashell fragments and lead contamination show significant human activity at the location for two millennia preceding Alexandria's founding. Alexandria was not only a center of Hellenism, but was also home to the largest urban Jewish community in the world. The Septuagint, a Greek version of the Tanakh, was produced there. 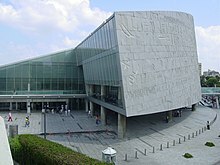 The early Ptolemies kept it in order and fostered the development of its museum into the leading Hellenistic center of learning (Library of Alexandria), but were careful to maintain the distinction of its population's three largest ethnicities: Greek, Jewish, and Egyptian. By the time of Augustus, the city walls encompassed an area of 5.34 km2, and the total population in Roman times was around 500-600,000. According to Philo of Alexandria, in the year 38 of the Common era, disturbances erupted between Jews and Greek citizens of Alexandria during a visit paid by the Jewish king Agrippa I to Alexandria, principally over the respect paid by the Jewish nation to the Roman emperor, and which quickly escalated to open affronts and violence between the two ethnic groups and the desecration of Alexandrian synagogues. The violence was quelled after Caligula intervened and had the Roman governor, Flaccus, removed from the city. In AD 115, large parts of Alexandria were destroyed during the Kitos War, which gave Hadrian and his architect, Decriannus, an opportunity to rebuild it. 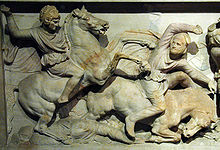 In 215, the emperor Caracalla visited the city and, because of some insulting satires that the inhabitants had directed at him, abruptly commanded his troops to put to death all youths capable of bearing arms. On 21 July 365, Alexandria was devastated by a tsunami (365 Crete earthquake), an event annually commemorated years later as a "day of horror". The Islamic prophet Muhammad's first interaction with the people of Egypt occurred in 628, during the Expedition of Zaid ibn Haritha (Hisma). 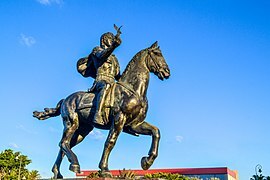 He sent Hatib bin Abi Baltaeh with a letter to the king of Egypt (in reality Emperor Heraclius) and Alexandria called Muqawqis. In the letter Muhammad said: "I invite you to accept Islam, Allah the sublime, shall reward you doubly. But if you refuse to do so, you will bear the burden of the transgression of all the Copts". During this expedition one of Muhammad's envoys Dihyah bin Khalifa Kalbi was attacked, Muhammad sent Zayd ibn Haritha to help him. Dihya approached the Banu Dubayb (a tribe which converted to Islam and had good relations with Muslims) for help. When the news reached Muhammad, he immediately dispatched Zayd ibn Haritha with 500 men to battle. The Muslim army fought with Banu Judham, killed several of them (inflicting heavy casualties), including their chief, Al-Hunayd ibn Arid and his son, and captured 1000 camels, 5000 of their cattle and 100 women and boys. The new chief of the Banu Judham who had embraced Islam appealed to Muhammad to release his fellow tribesmen, and Muhammad released them. Rhakotis is the old city that was absorbed into Alexandria. It was occupied chiefly by Egyptians. (from Coptic Rakotə "Alexandria"). Engraving by L F Cassas of the Canopic Street in Alexandria, Egypt made in 1784. Alexandria has a borderline hot desert climate (Köppen climate classification: BWh), approaching a hot semi-arid climate (BSh). 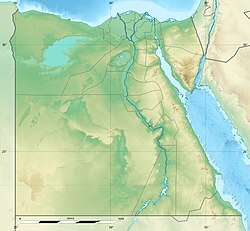 As the rest of Egypt's northern coast, the prevailing north wind, blowing across the Mediterranean, gives the city a less severe climate from the desert hinterland. Rafah and Alexandria are the wettest places in Egypt; the other wettest places are Rosetta, Baltim, Kafr el-Dawwar, and Mersa Matruh. The city's climate is influenced by the Mediterranean Sea, moderating its temperatures, causing variable rainy winters and moderately hot summers that, at times, can be very humid; January and February are the coolest months, with daily maximum temperatures typically ranging from 12 to 18 °C (54 to 64 °F) and minimum temperatures that could reach 5 °C (41 °F). 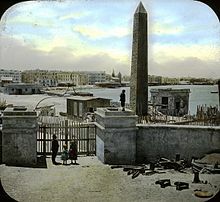 Egypt – Obelisk, Alexandria. Brooklyn Museum Archives, Goodyear Archival Collection. Side view of The Temple of Taposiris Magna. The most famous mosque in Alexandria is Abu al-Abbas al-Mursi Mosque in Bahary. Other notable mosques in the city include Ali ibn Abi Talib mosque in Somouha, Bilal mosque, al-Gamaa al-Bahari in Mandara, Hatem mosque in Somouha, Hoda el-Islam mosque in Sidi Bishr, al-Mowasah mosque in Hadara, Sharq al-Madina mosque in Miami, al-Shohadaa mosque in Mostafa Kamel, Al Qa'ed Ibrahim Mosque, Yehia mosque in Zizinia, Sidi Gaber mosque in Sidi Gaber, and Sultan mosque. The most important Eastern Orthodox churches in Alexandria are Agioi Anárgyroi Church, Church of the Annunciation, Saint Anthony Church, Archangels Gabriel & Michael Church, Taxiarchon Church, Saint Catherine Church, Cathedral of the Dormition in Mansheya, Church of the Dormition, Prophet Elijah Church, Saint George Church, Saint Joseph Church in Fleming, Saint Joseph of Arimathea Church, Saint Mark & Saint Nektarios Chapel in Ramleh, Saint Nicholas Church, Saint Paraskevi Church, Saint Sava Cathedral in Ramleh, Saint Theodore Chapel and the Russian church of Saint Alexander Nevsky in Alexandria, which serves the Russian speaking community in the city. 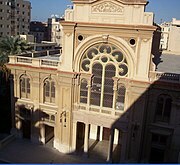 The Apostolic Vicariate of Alexandria in Egypt-Heliopolis-Port Said has jurisdiction over all Latin Church Catholics in Egypt. 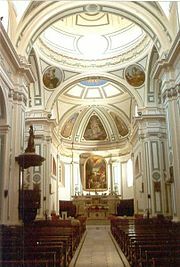 Member churches include Saint Catherine Church in Mansheya and Church of the Jesuits in Cleopatra. The city is also the nominal see of the Melkite Greek Catholic titular Patriarchate of Alexandria (generally vested in its leading Patriarch of Antioch) and the actual cathedral see of its Patriarchal territory of Egypt, Sudan and South Sudan, which uses the Byzantine Rite, and the nominal see of the Armenian Catholic Eparchy of Alexandria (for all Egypt and Sudan, whose actual cathedral is in Cairo), a suffragan of the Armenian Catholic Patriarch of Cilicia, using the Armenian Rite. 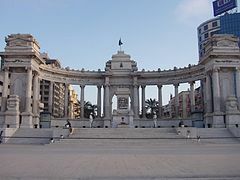 Alexandria is served by El Nouzha Airport which is currently closed and Borg El Arab Airport which is located about 25 km (16 mi) away from the city center. An extensive tramway network was built in 1860 and is the oldest in Africa. The network begins at the El Raml district in the west and ends in the Victoria district in the east. Most of the vehicles are blue in color. Some smaller yellow-colored vehicles have further routes beyond the two main endpoints. The tram routes have one of four numbers: 1, 2, 5, and 6. All four start at El Raml, but only two (1 and 2) reach Victoria. There are two converging and diverging points. The first starts at Bolkly (Isis) and ends at San Stefano. The other begins at Sporting and ends at Mostafa Kamel. Route 5 starts at San Stefano and takes the inner route to Bolkly. Route 6 starts at Sidi Gaber El Sheikh in the outer route between Sporting and Mustafa Kamel. Route 1 takes the inner route between San Stefano and Bolkly and the outer route between Sporting and Mustafa Kamel. Route 2 takes the route opposite to Route 1 in both these areas. The tram fares are 50 piastres (0.50 pounds), and 100 piastres (1.00 pounds) for the middle car. Some trams (that date back the 30s) charge a pound. The tram is considered the cheapest method of public transport. A café operates in the second floor of the first car of tram 1 (a women only car) which costs 5 L.E per person, also offering a WiFi service. A luxury light blue tram car operates from San Stefano to Ras El Tin, with free WiFi and movies and songs played inside for 5 L.E per ticket. 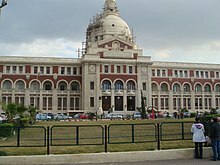 Alexandria has four ports; namely the Western Port, which is the main port of the country that handles about 60% of the country's exports and imports, Dekhela Port west of the Western Port, the Eastern Port which is a yachting harbor, and Abu Qir Port at the northern east of the governorate. It is a commercial port for general cargo and phosphates. The Kom el shoqafa Catacombs are located in Alexandria, Egypt. the catacombs are considered one of the Seven Wonders of the Middle Ages and date back to the 2nd century. The remnants of Pompey's Pillar still remain today. This single pillar represents the elaborate temple which once stood in Alexandria. It remains at the site of the Serapeum, Alexandria's acropolis. The Serapeum, which stood for ancient tradition, conflicted with the rise of Christianity. It is a large tourist destination, today. the Roman Amphitheatre of Alexandria is another popular destination. Here, there remains a stage with around seven hundred to eight hundred seats. They also have numerous galleries of statues and details leftover form this time. Alexandria's tourism office announced plans to reserve some beaches for tourists in July 2018. ^ "Alexandria Governor - Dr. Abd El Aziz Konsowa". 29 January 2019. ^ "Alexandria". Collins Dictionary. n.d. Retrieved 24 September 2014. ^ "Alexandria, Egypt". Ancient History Encyclopedia. Retrieved 2018-11-22. 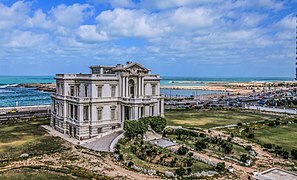 ^ "Do fundo do mar... Sea bottom: Sediments Reveal Alexandria's Hidden History". Retrieved 2017-01-28. ^ a b c d "The Lighthouse Dims". Foreign Policy. 23 December 2014. ^ Erskine, Andrew (April 1995). "Greece & Rome, 2nd Ser.,". Culture and Power in Ptolemaic Egypt: the Museum and Library of Alexandria. 42 (1): 38–48 . One effect of the newly created Hellenistic kingdoms was the imposition of Greek cities occupied by Greeks on an alien landscape. In Egypt, there was a native Egyptian population with its own culture, history, and traditions. The Greeks who came to Egypt, to the court or to live in Alexandria, were separated from their original cultures. Alexandria was the main Greek city of Egypt and within it there was an extraordinary mix of Greeks from many cities and backgrounds. ^ Erskine, Andrew (April 1995). "Culture and Power in Ptolemaic Egypt: the Museum and Library of Alexandria". Greece & Rome. 42 (1): 38–48. doi:10.1017/S0017383500025213. The Ptolemaic emphasis on Greek culture establishes the Greeks of Egypt with an identity for themselves. 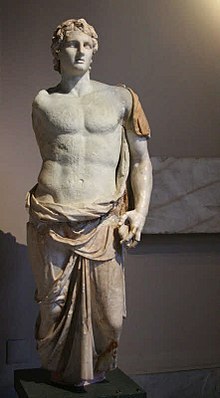 [...] But the emphasis on Greek culture does even more than this – these are Greeks ruling in a foreign land. The more Greeks can indulge in their own culture, the more they can exclude non-Greeks, in other words Egyptians, the subjects whose land has been taken over. The assertion of Greek culture serves to enforce Egyptian subjection. 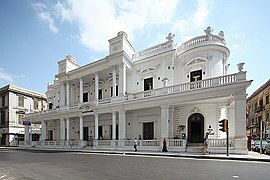 So the presence in Alexandria of two institutions devoted to the preservation and study of Greek culture acts as a powerful symbol of Egyptian exclusion and subjection. Texts from other cultures could be kept in the library, but only once they had been translated, that is to say Hellenized. [...] A reading of Alexandrian poetry might easily give the impression that Egyptians did not exist at all; indeed Egypt itself is hardly mentioned except for the Nile and the Nile flood, [...] This omission of the Egypt and Egyptians from poetry masks a fundamental insecurity. It is no coincidence that one of the few poetic references to Egyptians presents them as muggers. ^ Diana Delia, "The Population of Roman Alexandria", Transactions of the American Philological Association Vol. 118 1988, pp. 275–292, 278, 284. ^ Philo of Alexandria, Against Flaccus. ^ "Modern" "The History of Alexandria". Archived from the original on 24 May 2013. Retrieved 24 May 2013. ^ Ted Thornton, "Nasser Assassination Attempt, October 26, 1954," Middle East History Database "Nasser Assassination Attempt, October 26, 1954". Archived from the original on 5 January 2010. Retrieved 24 May 2013. ^ Ibn Batuta (2009). The travels of Ibn Battuta in the Near East, Asia and Africa 1304–1377. Translated by Lee, Samuel. New York: Cosimo. ISBN 9781605206219. OCLC 502998972. ^ Josiah Russell, 1958, "Late Ancient and Medieval Population," pp. 67 and 79. ^ Elio Lo Cascio, 2009, "Urbanization as a Proxy of Growth," p. 97 citing Bagnall and Frier. ^ "Egypt Climate Index". Climate Charts. Retrieved 20 June 2013. ^ "Deadly flash floods hit Egypt's Alexandria". aljazeera.com. 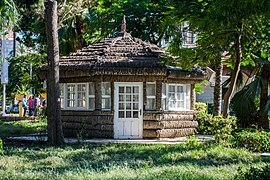 ^ "Clima en Alexandria / Nouzha – Históricos el tiempo". Tutiempo.net. Retrieved 12 March 2013. ^ a b "Alexandria, Egypt". Voodoo Skies. Retrieved 3 August 2015. ^ "Weather Information for Alexandria". Retrieved 21 August 2017. ^ "Climatological Information for Alexandria, Egypt" (1961–1990)". Hong Kong Observatory. ^ "Alexandria, Egypt: Climate, Global Warming, and Daylight Charts and Data". Archived from the original on 1 January 2011. Retrieved 20 June 2013. ^ "Alexandria Climate and Weather Averages, Egypt". Weather2Travel. Retrieved 20 January 2014. ^ "NOVA Online | Mysteries of the Nile | 27 August 1999: The Third Attempt". Pbs.org. 27 August 1999. Retrieved 5 May 2009. ^ Planet, Lonely. "Catacombs of Kom ash-Suqqafa – Lonely Planet". lonelyplanet.com. ^ "Fgs Project Alexandria". Underwaterdiscovery.org. Archived from the original on 7 March 2010. Retrieved 14 June 2010. ^ "Divers probe underwater palace". BBC News. 28 October 1998. Retrieved 19 January 2009. ^ "New underwater tourist attraction in Egypt". BBC News. 24 September 2000. Retrieved 19 January 2009. ^ "A new gateway for Alexandria". Al-Ahram Weekly. Archived from the original on 4 September 2009. ^ Raven, James (2004). Lost Libraries: The Destruction of Great Book Collections Since Antiquity. Springer. p. 12. ISBN 0230524257. 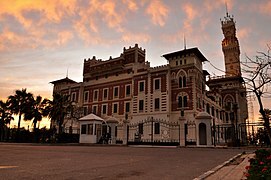 ^ "Egypt's Alexandria to create private tourist-only beaches". Egypt's Alexandria to create private tourist-only beaches (in Turkish). Retrieved 2018-07-30. ^ "Sister Cities International (SCI)". Sister-cities.org. Archived from the original on 13 June 2015. Retrieved 21 April 2013. 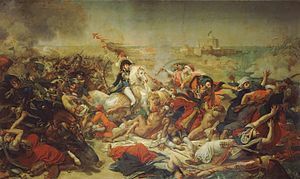 ^ "Accords de coopération" (PDF). Site Officiel de la Ville de Marseille (in French). ^ "Limassol Twinned Cities". Limassol (Lemesos) Municipality. Archived from the original on 2013-04-01. Retrieved 2013-07-29. ^ "Paphos and Alexandria sign twining protocol". In-Cyprus.com. Retrieved 2018-07-13. ^ "Shanghai Foreign Affairs". www.shfao.gov.cn. Retrieved 2018-09-01. ^ "Αδελφοποιημένες Πόλεις" Archived 24 April 2016 at the Wayback Machine. 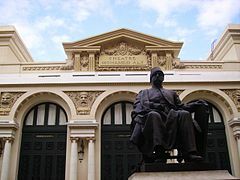 Municipality of Thessaloniki. 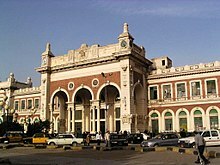 Wikivoyage has a travel guide for Alexandria. 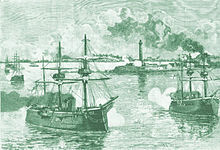 "Alexandria". Egyptian government, Ministry of state For Administrative Development. 2014. "Greek Community of Alexandria". 2015. Map of Alexandria, ca.1930, Eran Laor Cartographic Collection, The National Library of Israel. Capital cities are in bold font. This page was last edited on 1 April 2019, at 19:49 (UTC).